We hear conflicting things about fish these days. One day, we’re told they’re good for us because they are high in omega-3 fatty acids; another day, we’re told they are dangerous because of high levels of mercury. We know that some are farm-raised and others are wild caught; that some are overfished and others are caught in ways that harm other marine creatures. But with a long list of what’s healthy and what’s not, and another of what’s sustainable and what’s not, making conscious seafood decisions can be frustrating. Here’s a list to end the frustration. After scouring information from the Environmental Defense Fund, which issues Health Alerts for fish containing mercury and other contaminants; and from the Monterey Bay Aquarium Seafood Watch, which monitors the population health of seafood species worldwide, we compiled this list of fish that are both good for you and good for the planet. With low levels of mercury and other contaminants, excellent population health, and sustainable and environmentally friendly fishing or farming methods, these fish offer meal options that are both healthy and eco-friendly. Rainbow trout is one of many types of trout, a freshwater fish in the same family as salmon. It has orange-pink flesh that is firm but tender, and often has a mild nutty or earthy flavor. It is high in omega-3 fatty acids and has a moderate fat content, with about five grams of fat and 20 grams of protein per 100-gram serving. Rainbow trout farms in the United States are well managed, with ecologically responsible practices that involve continuously flowing water and responsible waste collection. There is low risk of escaped fish or of pollution from U.S. rainbow trout farms. The fish are available fresh and frozen, as both whole fish and fillets. Rainbow trout may also be available smoked. Atlantic Mackerel is a relative of tuna, with an oily, firm flesh and a savory, strong flavor. While other species of mackerel, including King Mackerel and Spanish Mackerel, have high levels of mercury, Atlantic Mackerel have very low levels of contaminants. The fish is high in omega-3’s and has a high fat content, with about 14 grams of fat and 19 grams of protein per 100-gram serving. Atlantic Mackerel breed often, are fast growing, and are migratory, which helps the population withstand fishing pressures. United States fisheries, mostly in the North Atlantic, are well managed and sustainable, incorporating trawls and purse seines, two methods that result in little to no bycatch in Atlantic waters. Atlantic Mackerel is available as whole fish as well as fillets and steaks, either fresh or frozen. Mackerel can also be found smoked and salted. Tilapia is a freshwater fish with pale, white flesh and a mild, sweet taste. Tilapia from outside the United States should be avoided, as populations in Latin America and Asia are raised in open systems that pose high risk of escaped fish, which are then a threat to indigenous ecosystems. Conversely, tilapia farming in the United States poses little risk and is well managed, with closed tank systems on dry land that ensure against pollution and escaping fish. The fish are raised on a mostly vegetarian diet, are very low in fat, and have one of the lowest levels of mercury of all fish species tested. Tilapia is available fresh and frozen, both as whole fish and as fillets. While they may have a bad reputation, Pacific Sardines are an excellent seafood choice from both an environmental and health perspective. The small fish are related to herring, and boast a dark, moderately fatty flesh, with about 12 grams of fat per 100 gram serving. They are low in mercury and other contaminants, and populations are resilient to fishing pressure, as the fish grow quickly and breed often. Sardines are usually sold as whole fish, and are available canned as well as fresh. While salmon is one of the most widely available fish and is both wild-caught and farm-raised, consumers should be aware that, specifically, wild Alaskan salmon is the best choice from an environmental standpoint. Alaskan salmon fisheries are some of the best managed in the United States, with sustainable practices that ensure little bycatch and a healthy population. By contrast, farmed salmon (often labeled as Atlantic Salmon) should be avoided, as the byproduct of these operations includes pollution, chemicals, and parasites that can escape to wild populations. 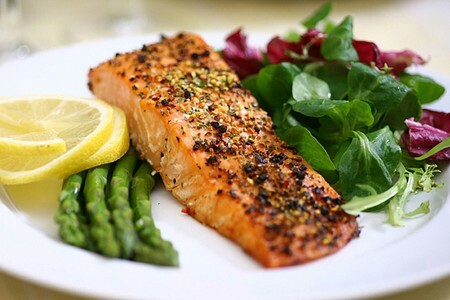 Salmon’s coloring ranges from light pink to deep red, and its meat is high in omega 3’s and has low to no contaminants. It is moderately fatty, with about six grams of fat and 21 grams of protein per 100 grams. Salmon is available whole as well as cut in fillets and steaks, both fresh and frozen. While you may wrinkle your nose at them on your pizza, anchovies are an excellent choice in terms of both health and environment. The saltwater fish are low in fat and high in omega 3’s, with five grams of fat and 20 grams of protein per 100 gram serving. They have low to no contaminant levels, partly due to their short life span. And because of their short life span and the frequency that they reproduce, populations are able to withstand heavy fishing. Most anchovies available in the United States are canned European anchovies, which are fished with purse seines (nets) off the coast of Morocco, Turkey, and Italy, with a relatively low bycatch. Northern anchovies are also a good choice, although not as widely available, and are caught off the coast of the United States. Artic Char is a fish in the salmon family, and is high in omega 3’s, with a bright pink, moderately fatty flesh. Artic Char is mostly farmed in the United States, in well-managed, closed systems that pose little risk of contamination, escape, or pollution. In addition to the United States, the fish is also farmed sustainably in Canada, Norway, and Iceland. It is available whole or as steaks, and is also sold smoked and canned. Artic Char is an excellent alternative to farmed salmon. Also known as Black Cod, this Pacific-Ocean fish is high in omega 3’s as well as vitamins A and D, and is relatively low in contaminants, with moderate mercury levels. It has a moderately high fat content, with about 15 grams of fat and 13 grams of protein per 100 grams, and boasts a white color, soft texture, and sweet, buttery flesh. The populations in the waters of Alaska and British Columbia are healthy and abundant, and the methods used to catch them—bottom longlines—result in low bycatch. Sablefish is also farmed off the coasts of California, Oregon, and Washington, although they are less abundant and the catching methods result in more bycatch, so Alaskan Sablefish is preferable. The fish is available whole or in steaks and fillets, and is sold fresh as well as smoked. For more information the environmental health of various seafood species, including printable pocket guides, visit the Environmental Defense Fund Seafood Selector and the Monterey Bay Aquarium Seafood Watch websites.